The sheer size of our universe is just about unfathomable, so you can imagine the surprise that researchers must have experienced when they recently discovered a structure within our universe that measured 5 billion light years across. That’s more than one-ninth the size of the entire observable universe, and by far the largest structure ever discovered. In fact, this mysterious structure is so colossal that it could shatter our current understanding of the cosmos. Just what is this massive structure? It’s not a single, physical object, but rather a cluster of nine massive galaxies bound together gravitationally, much like how our Milky Way is part of a cluster of galaxies. 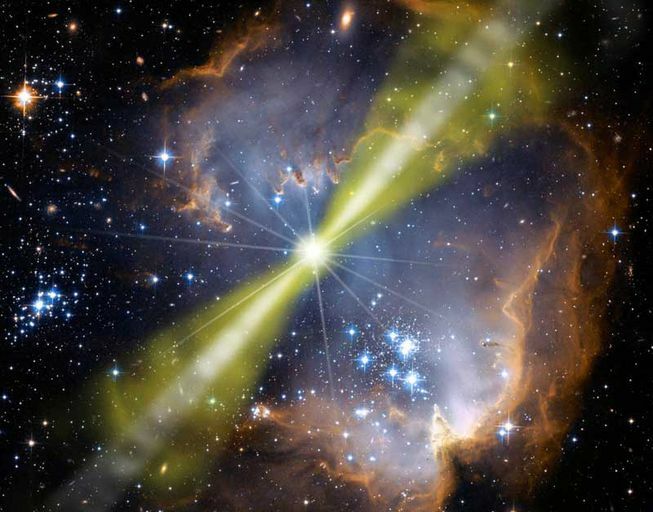 It was discovered after researchers identified a ring of nine gamma ray bursts (GRBs) that appeared to be at very similar distances from us, each around 7 billion light years away. GRBs are the brightest electromagnetic events known to occur in the universe, caused by a supernova. Their detection typically indicates the presence of a galaxy, so all of the GRBs in this ring are believed to each come from a different galaxy. But their close proximity to one another suggests that these galaxies must be linked together. There is only a 1 in 20,000 probability of the GRBs being in this distribution by chance. A mega-cluster of this size shouldn’t be possible, at least not if you think in terms of our current theories. Those theories predict that the universe ought to be relatively uniform on the largest scales, meaning that the sizes of structures shouldn’t vary by much. In fact, the theoretical limit to structure size has been calculated at around 1.2 billion light years across. If the Hungarian-American team’s calculations are correct, then this giant new structure– which measures in at over 5 billion light years across — would blow that classic model out of the water. In fact, either the researchers’ calculations are wrong on this, or scientists will need to radically revise their theories on the evolution of the cosmos. Needless to say, this GRB cluster discovery has the potential to cause a sweeping paradigm shift in astronomy. At the very least, it reminds us just how small our view of the universe really is.